A small rectangular aquarium works well for this experiment. Try a 2-1/2-gallon or 5-gallon tank. Any other square or rectangular clear glass or plastic container will work. Fill the container with about 3/4 full of water. Turn on the flashlight and hold it flat against the side of the container. You probably won't be able to see the beam of the flashlight, although you may see bright sparkles where the light strikes dust, air bubbles, or other small particles in the water. This is much like how sunlight travels through space. Add about 1/4 cup of milk (for a 2-1/2 gallon container—increase the amount of milk for a larger container). Stir the milk into the container to mix it with water. Now, if you shine the flashlight against the side of the tank, you can see the beam of light in the water. Particles from the milk are scattering light. Examine the container from all sides. Notice if you look at the container from the side, the flashlight beam looks slightly blue, while the end of the flashlight appears slightly yellow. Stir more milk into the water. As you increase the number of particles in the water, the light from the flashlight is more strongly scattered. The beam appears even bluer, while the path of the beam furthest from the flashlight goes from yellow to orange. If you look into the flashlight from across the tank, it looks like it is orange or red, rather than white. The beam also appears to spread out as it crosses the container. The blue end, where there are some particles scattering light, is like the sky on a clear day. The orange end is like the sky near sunrise or sunset. Light travels in a straight line until it encounters particles, which deflect or scatter it. In pure air or water, you can't see a beam of light and it travels along a straight path. When there are particles in the air or water, like dust, ash, ice, or water droplets, light is scattered by the edges of the particles. Milk is a colloid, which contains tiny particles of fat and protein. Mixed with water, the particles scatter light much as dust scatters light in the atmosphere. Light is scattered differently, depending on its color or wavelength. Blue light is scattered the most, while the orange and red light is scattered the least. Looking at the daytime sky is like viewing a flashlight beam from the side -- you see the scattered blue light. Looking at sunrise or sunset is like looking directly into the beam of the flashlight -- you see the light that isn't scattered, which is orange and red. 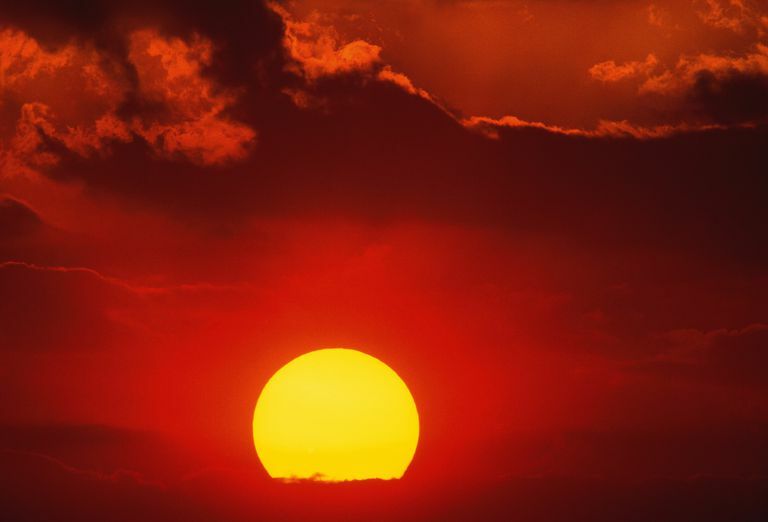 What makes sunrise and sunset different from the daytime sky? It's the amount of atmosphere the sunlight has to cross before it reaches your eyes. If you think of the atmosphere as a coating covering the Earth, sunlight at noon passes through the thinnest part of the coating (which has the least number of particles). Sunlight at sunrise and sunset has to take a sideways path to the same point, through a lot more "coating", which means there are a lot more particles that can scatter light.